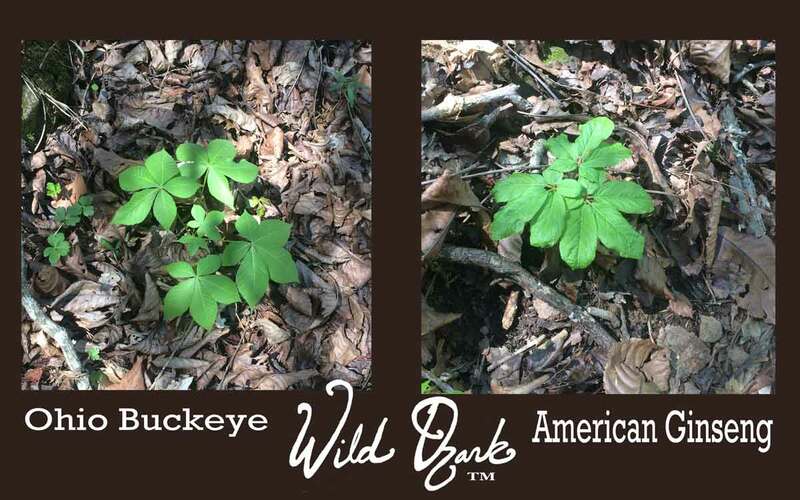 Learning the Difference: Ginseng or Buckeye? Is it ginseng? No, it’s buckeye. There are a few plants that grow here in the Ozarks that make it really difficult for newbies to identify ginseng. That’s because these look so much like ginseng to the inexperienced eye. These are called ginseng look-alikes. One of the look-alikes is Ohio buckeye (Aesculus flava). This is a tree native to the Ozarks. It begins blooming in very early spring with pale yellow flower spires at the tip end of branches. The leaves are palmate, meaning it has five leaves or leaflets. When the buckeyes are young, the saplings are only about a foot tall or sometimes even less. The little trees have a few branches on them already, spreading out to look a lot like the prongs of ginseng. Although the leaves of buckeye are similar to ginseng, there’s some telling differences. At first glance they look alike. But look closer. American ginseng leaves are also palmate, but the two lower leaves are a lot smaller than the other three leaves. The ginseng in the photo is just finished unfurling so the leaves are still a little wrinkled. They’ll smooth out in a day or two. On each palmate leaf, ginseng’s lower two leaves are much smaller than the other three. Aside from the size of the two lower leaves, the stems to each of ginseng’s prongs all meet up at the exact same spot on the stem. Not so with the buckeye. The branches (they’re not prongs) attach to the trunk (it’s not necessarily a stem, even if it is still small like one) at various points. And a third way to tell is to examine the nature of the stem/trunk. Ginseng stems are not woody. Buckeye stems are. If you are careful, you could dig up both plants to take a look at the roots too. Buckeye roots resemble small tree roots (larger main roots with smaller roots attached) and they’re tough and covered with a sort of bark. Ginseng roots have one main root, sometimes branched, but it does not have a bark sort of coating. The buckeye stem/trunk never dies back once it has begun growing. Ginseng stems die back every year and the root sends up a new one each spring. In fact, next year’s bud is already in place and waiting at the base of the ginseng stem. Buckeye will not have this bud. Join me at the Nursery and Habitat Garden on May 6 if you’d like to get up close and personal to both ginseng and the look-alikes like buckeye. The “Pot 10 Keep 1” event will be going on and if you help me out by potting up ten ginseng seedlings for me, you’ll get to keep one to bring home. If you pot up a hundred, you’ll get to keep ten. Or you can buy however many you want for $5/ea. While you’re here you can walk the trails of my Ginseng Habitat Garden and learn to tell the difference between the look-alikes and the ginseng. The garden itself is not large and the trails are not long. It’s an accurate example of what the average habitat area looks like here, except this one has been restored. Years ago this land was logged, and this is one of the spots that is just now getting back close to habitable for the shade-loving plants like ginseng. It’s not yet ideal, but close enough to work with. You can get ideas for how to do the same thing on your own property and create a little sanctuary or lots of little sanctuaries as I’ve been doing. Join the mailing list for this event so I can send you the address and update you on schedule changes. If it rains much the day before or the day of, we’ll have to reschedule. The garden is across the creek and if it’s high then it’s too hazardous to walk across it. It’s completely free to participate! The garden is only open by appointment during spring, summer, and fall. During events like this one, I’ll be out there already, so no appointment necessary. All visitors are required to sign a hold-harmless liability waiver. Because nature is what it is. There are rocks, ticks, snakes, and treacherous footing all around and I can’t guarantee you won’t fall while crossing the creek or encounter some of our less friendly wildlife. But I can guarantee an experience hard to find elsewhere. Here on the website I have a lot of information about ginseng and the look-alikes. Here’s a good starting point: Ginseng Articles and Headlines. I should give more info. I live in Kentucky & just bought some land. My husband is the native here. He has collected ginseng before when he was young. But he works alot, so I will be on my own, for the most part, to look for ginseng. So I was wondering when the flower blooms? Ehen does the fliwer bloom on ginseng? Hi Tia, the flowers bloom in may here in the Ozarks (usually). This year they’re all running a little later and so the buds are there but none of them have opened yet. But I’d look for them at least by the end of May and probably within a couple of weeks. It’s not legal to collect them until September, though, and the plants have to be at least 5 years old here in Arkansas. Some states require them to be 10 and Missouri even requires the tops to still be attached. I’m not familiar with Kentucky laws. The fourth way is to wait a few years and see which one is becoming a tree. 🙂 Ha! Good one!! LOL I totally didn’t think of that. Could be because that kind of patience isn’t in my wheelhouse, ha. 🙂 The fifth way is to wait until a giant nut drops on your head!! Haha, you’re on a roll. That is definitely a long term method ?